We arrived home this afternoon from our gorgeous honeymoon. We were so sad to leave Paris and it seems so odd to have just been there, scoffing croissants and sipping hot chocolate yesterday, and today, it’s back to real life. We still have a few bits of our wedding to hang on to for the next couple of days but come Monday, it’s back to the grind. Pitch Perfect – 4 stars! – OMG. Accawesome! This film is funny and brilliant and reminded me that I need to watch more dance, singing and 80s movies this year. I LOVE Rebel Wilson. She is choosing some really brilliant roles for herself. She does tend to play the same role, but I love it. In Pitch Perfect, she was funny without her being fat being the joke. And she’s just outstandingly confident and self assured and brilliant. And sometimes her confidence is situationally over the top but not always. LOVE her. (Also, oddly quite loving Anna Kendrick even when I didn’t really love her in Step Up 4). Paris Manhattan – 3.5 stars – French film debut by Sophie Lellouche – Alice is obsessed with Woody Allen. Her Parisian Jewish family are odd, or perhaps not really. She is 30 and single and not wanting to be. But she’s complex and difficult. Set in the 4th Quarter of Paris, I loved the backdrop for its familiarity. And it had a happy ending. What I noticed though, including with The Closer, is lately I have been choosing and enjoying TV and Film with female characters as leads, who are interesting and complex and are romantically with men who genuinely love them for who they are and are interested in what it is that they are doing, actively support and encourage it. That’s kind of a really nice trend. I have many blog posts to make and I’m sure they will tumble out over the next week or so. I’ve only got a couple of days left in Paris and my thoughts have been turning to the serious business of 2013. There is much to do. There is much I would like to do. And there is much I learned from 2012 that I would like to implement in 2013. The most important of which is happiness. 2012 was one of the best years of my life. So much good happened to me in it and I want to clutch onto every last strand of it and bring it with me. So here are my resolutions and/or goals for 2013. And how I think I am going to ensure I achieve them. 1. The most important one: learn to focus on the positive and not the negative. Something that was really highlighted for me in 2012 was that I will always mull over the negative – the one bad review against 23 good ones and an award win, the two people who don’t like me, the three people who can’t make an event etc etc. And there were some really really ridiculous moments last year that worked to slap me awake to my thought processes. One of those was the overwhelming attendance at the TPP Hour at Natcon. I remember standing on a chair about to speak and looking round the room and seeing so many familiar and smiling faces. I had a very similar moment when I was standing in front of everyone at our wedding ceremony, I was terrified in the moment and then looked up and around, to so many familiar and smiling faces. This year, I want to consciously focus on the positive of situations, friends and events. I want to spend the year reprogramming the way I default react to things. I’m going to let the evidence speak for itself and I’m going to learn to stop nitpicking successes into failures. 2. Lose 5 to 8 kg. This one is here and written this way because it’s part of something from last year. I could rewrite it as “become fit” or “become healthy” or whatever and elsewhere, these goals are broken down and itemised that way. But when I come back at the end of the year, how do you tick that off? Last year I lost 14kg. I did that. And I did it through the Michelle Bridges 12 Week Body Transformation program. I’m signed up for it again and will probably (finances allowing) do it for the whole of 2013 as well. In this program I am learning so much about menu planning, balanced eating, healthy eating, exercising (though this one I did not do that great), goal setting, consistency and a little bit of cooking. In the coming year, I want to learn how to carry on a healthy lifestyle beyond the program so that in 2014, I can do it on my own. According to the BMI chart, I actually need to lose something like 14kg again to be in the “healthy weight” bracket. I dunno about that so I’m setting myself a more conservative number and then I’m going to reassess. In any case, I want to aim for a goal weight and then maintain it in 2013 and beyond. I’m unbelievably crap at doing something daily (see points made above). I’m crap at taking medication every day, or following a skin care routine or exercising or whatever. (and yet, by the way, I am excellent at falling into bad for you daily routines, like the 4 years I ate a huge bowl of cookies and cream icecream plus milo right before bed, or the caffeine habit I just kicked, again). But apparently, being “successful” involves being consistent and having routines and training yourself to expect things. Importantly, for example, to beat insomnia, a shut down ritual in the lead up to bed is recommended – like you do with kids – and doesn’t include tv or the laptop etc. And “apparently” you can find more inner peace and balance if you don’t wake up and immediately check email, twitter and chug down your first coffee. I dunno. I kinda like doing all those things but I’m also coming over a pretty full on and stressful five years stint and I’m thinking a bit more zen, chamomile tea, yoga and contemplation does kinda sounds … well … nice. Plus, stress stifles creativity. So. I’m yet to actually map out what these routines will be or involve and also how I will get into the habit but hey … 51 weeks of the year still left, I’ll get there. 1. TPP has never been a regimented, time blocked activity. I mastered the art of that story – you know the one about filling the jar with rocks and then gravel and then sand and then water – I filled in every and any free moment with TPP, if I had a moment, I’d be doing something for TPP in it. That’s a really really really hard habit to break. I told myself NO TPP on my honeymoon and well, I *mostly* managed that? But you see the problem. It’s going to be really hard to sit down and start and then end at the end of the day. I can already find myself saying, yes well but 7.5 hours a day? That’s not really enough time to get it all done. I want to make sure that I fill the time that I will find myself having with all the things that I gave up over the last few years – some of my hobbies got neglected, hanging out with my friends, going to the movies, seeing my family etc etc. 2. This is not my first ride round the carousel. I already was accepted into a postgrad program and lived that dream. I already know how hard it is, how much work there is and how much it crushes your soul. And I know how to not finish. Been there and done that one. I also know that the very successful students in the other program I was in were so because they treated it like a day job. They showed up at nine, worked til their half hour lunch break, and then worked again til five. When they went home. And they did this every single day. They were not distracted by Buffy or tim tam morning teas or crushes or fanfic or lj etc. Thus, this resolution. And when this one kicks in, I’m going to be adding exercising to my morning routine, as in the whole eat the frog first thing (do the worst thing on your to do list for the day first and it’s all uphill from there). This one should be taken care of/executing numbers 2, 3 and 5 above. 7. Publish at least most of the remaining Twelve Planets volumes. I really had aimed to wrap this up in 2013. And I am still working on that happening – if I can Make It So, I will! But life gets in the way and some things can’t be helped. And personally, I prefer a great book over meeting a deadline. But Asymmetry will be out very soon and volume 9 is not far off after that. 8. Publish two novels and an anthology. What it says on the label. More on than anthology soon. 9. Apply for every arts grant I am eligible for. This one is such a bane in my side but this year, I am determined! It’s been a very long (two years so far) process to sort out paperwork, and company structures and we still have to get audited etc, so lots still to do. But, what it says. 10. Through Splintered Walls art project. This one has been in the works ever since we discovered the printing error. Kaaron, Narrelle and I were standing in the dealers room at Natcon pouring over the books, the covers looked so gorgeous and there was this heartbreaking error that we couldn’t fix or take back or in any way save that print run. I had confirmed it was not an error on our part so I knew the printer would fix it (and then did, within 3 days) and we did our best to retrieve every copy we could for replacement. But as we stood there looking at these books, as an environmentalist, I just couldn’t bring myself to pulp them; for all that paper to have been wasted. And Narrelle said – turn it into an art project! And there we were, the three of us in 0 to 3 secs, taken from heartbroken, crushed and depressed to excited, inspired and buzzing! We worked on the idea, bounced ideas off each other and eventually approached Lee at the City of Rockingham, which is where I live and which has a pretty cool culture and arts program (and coordinator! ), and he also had some cool ideas. And the first workshop to learn paper arts kicks off in February. The project is away! And I can’t wait to see what it produces. 11. Grow TPP by 20%. This is pretty much the annual goal for TPP. But as I’m writing this, I’ve realised that not only is that a sales goal, I think it might also be a great wider goal. Over the last few years, TPP has grown in people working behind the scenes as well as in the writers and artists we work with and the projects we take on. I think I’m going to look at this one as more inclusive than just sales. I quite like that! 12. Win Last Short Story 2013. Okay so now I might just have let my fellow competitors know my intents. But there they are! 13. Read 20 books for fun. Yeah. Take that! Apparently I am to have more time this year! Woot! And I’m gonna throw in here signing up for the AWW 2013 challenge but I’ll figure out those details later. It’s a work in progress but I’d like to find it mostly liveable and comfy by the end of the year. It’s going to involve culling books and craft projects left by the wayside and clothes I no longer wear and all that crap I pack and schlepp from house to house when I move. 16. Start greening the backyard. 18. Reduce my yarn stash. This one I have already made instantly harder. I might have had a weak moment and sympathy for a soon to be crash strapped future me. And I fell and signed up for 1, just 1, sock club for 2013. I’m sure I can work this out. For the last week, I’ve been wracking my brains trying to figure out a complex rule for how I can make this one work. I’ll get there. Just give me a couple more days. This one is stolen from the Yarn Harlot who did this one year – she went into her stash of yarn and patterns and made up kits and threw them in a cupboard and took one out each month to complete. I want to do that. I need to take stock of the stash and then be honest about what I like and what I think someone else might like should a knitted item in that colourway be gifted to them. And then … get started. Direction. That’s all I need. And a plan. However. I have a shiny new husband. And that means … no more boyfriend curse!!! I can knit C a jumper!!! A manly one. I’m going to look into that. This comes back to the knitting before you die book I bought last year that kind of pointed out to me, I’d fallen into a knitting rut. And also, if I’ve never tried a bunch of things, I can’t really consider my skill levels to be advanced. I’ve been consciously challenging myself since and I’ve been thoroughly enjoying it. I’ve just knit two things that were new or used new yarns on my holiday and I realised, when I thought about it, that all the yarn I’d bought in the second half of 2012 was for a specific project AND got used. Which had me thinking and creating number 18 on this list because I think maybe, my stash is holding me back (plus serious lack of time) … it’s a thought in progress. More on that, end of 2013. 19. Reduce my fabric stash. 20. Learn to use a sewing machine. I have a very old Singer that was gifted to me. And I think it works – it was serviced etc. And if I could use a sewing machine, then I could not have to quilt my quilts by hand. I don’t think I really enjoy hand quilting and I think it gets in the way of finishing projects. I’d like to have a bunch of finished quilts at the end of the year and not just a bunch of finished quilt tops. I’m thinking of dragging my mum along to a course, we’ve talked about it before and I think this is the year we should do this. 21. Reduce To Be Read Pile. Stashes. They are no good for you. This is one of the lessons of 2012 I have learned. And I am still trying to coax myself to not be such a squirrel with the storing of nuts for the winter. They just stare at you and make you feel bad! This can be done in any way I like – culling, skim reading, returning to lender, sending straight to deep shelving cause I’m not really gonna read it, or reading it. Might be for fun and fulfill number 13. Might be for the PhD. We shall see. 22. Spend more time with those I love. I want to entertain more. I want to visit people more. I want to be more present. 23. Get properly in the GTD program. C says it can take 3 to 6 months to be properly with the program. I kinda didn’t get fully set up in 2012 cause … life … But GTD saved me in the second half of the year. My wedding planning would have been far more stressful without it and no way I could have still worked full time, done TPP and a bunch of other commitments without a meldown. (There was no meltdown). So I’m going to get back to finishing reading this book and implementing because, it’s awesome. By end of 2013, I want to live a zero inbox both electronically and paperwork and in my house. So I think I remember that project – I wanted to do another charm quilt with a block a month made from the mini charm squares. The rules being, use the fabric that arrives in the month before being allowed to purchase the next month’s, try new blocks and be cool about the charm quilt look of the product. And actually break into my Kona plains C bought me last year. Problem is, that the packs I bought, whilst I like each of them, don’t go with each other and I’m not sure I honestly like charm quilt looks – so itty and bitty and hard to focus the eye. I’ve been thinking about what else I could do with these cause I still like the idea of an ongoing project for the year – I really enjoyed the sewing circles I was in two years ago now. Not big projects. something that you can finish in a couple of nights but that makes you feel like you achieved something, even if it’s small, each month. 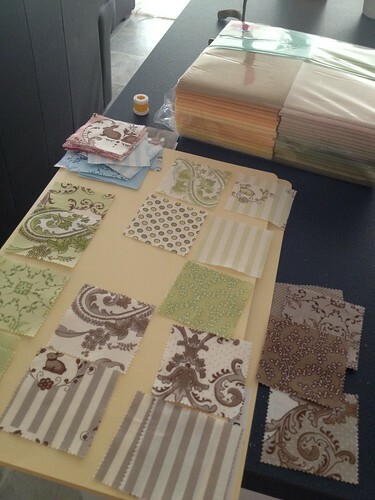 I’ve been looking at smaller projects – bags and cases and placemats and so on. Even thinking about gifting things I make. Thing is, I kinda think that stuff looks twee (except in those modern book photo shoots with lots of lime green and chocolate) and also … whilst I might not love the fabrics as my absolutely favourites, I dunno that i want to give away these projects. Which is a bit hoarder of me. And I don’t feel that way about knitted projects, which is weird. And how many quilted items does anyone person really need in life? Is it like 6? Maybe I don’t need to know the answer to any of these questions right now. Maybe the final product will emerge on its own? I do really like the idea of a project for 2013. I possibly have a knitting one as well. And … the exciting thing, which I can almost not quite conceive of, is that I might actually get my downtime/free time/ out of hours time back next year for … socialising without guilt or stress and hobbies other than publishing. I can barely conceive of this. I keep giving myself strict talks about it. But yes, I will need to learn how to spend my weekends not working, again, after 5 years. Yes, well. I think we’ve all learned something interesting here about me – I’m a nevous crafter. Ok? Can we move on already? I don’t know why you keep bringing it up! Whatev! *cough* it’s like 11 days til we get married. *mumble* Tonight we had our final meet which was with the photographer and we went through the whole day details etc. Gettin’ real. Tomorrow I have my final fitting for my dress and then I, like, take it home or something. I’m really looking forward to our work Christmas do – Friday lunch – cause that will be the end of work for me for the year and the beginning of my holidays plus pamper sessions intermingled with errand running of next week. First I have to finish a bunch of work deadlines (may not finish them all) and finish my job application for my job. Which may end up being my back up plan. We shall see. Yesterday I found out I was awarded scholarships for a Phd I might have applied for in a haze of October midair flying to Canada. Seriously. Was bouncing essays and application forms back and forward during the big flight to Toronto whilst Jonathan drank cocktails, watched all the TV shows on his iPad and generally laughed at me. I haven’t made any decisions or what not yet (hello getting married like in 5 minutes) but I’ve kept my boss in the loop and I’ll figure it all out. Any minute now. Anyway. There are more serious matters at hand than these pesky life choices. Like confessing all my Black Friday purchases. I’m going to document them here as they arrive so you know, and I know that you know. 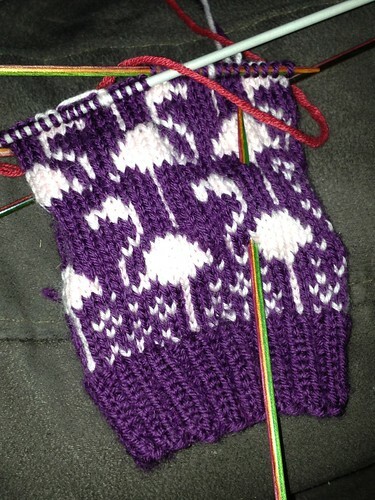 You see, last night, I was watching backlog Foxtel whilst working on this flamingo mitten – Hoarders Buried Alive. Now, I normally LOVE this show cause it makes me feel better about some of my untidiness or behindedness and it also gets me up out of my couch position and throwing out Things I Do Not Need to Keep. It’s good to have that reminder every now and then. But this episode I was watching came far too close to the home. This one had a woman who *deep breath* “collects fabrics” and other craft supplies. And she didn’t have them in huge mountains of trash with dogs wiping their arse on them or anything. Oh no. Hers were very sensibly and sanely organised in plastic bins and colour coded and stacked. Her collecting was not unsanitary or messy, it was just overwhelming because of its volume. And … sure, she had enough craft supplies to open her own decent sized craft store (her description) but … I couldn’t help but feel like a lot of her reasoning and explanation of how she got there was not unlike my own current stashing. Stashing’s all fun and games, it seems, til someone’s house gets taken over by it. And whilst, she had bigger issues, personally, I worry that my own tendency towards obsession needs to be kept in check. I don’t think I’m that far away from being a hoarder buried alive (other than the ten years or so slippery slope – make sure you do regular house inspections on me, m’kay?). Anyway. It got me thinking. I might have other reasons for needing to rein in the stashing hobby. But … really, it’s all a bit … out of control. I like ordering things online. And I like getting packages in the mail. And that’s all fine. But I’ve noticed recently that a) I’m not really churning out that many finished craft projects lately and b) almost every freaking time you decide to start a new project, you are held up by needing to get some part of the project. Like, no matter what scrap or fat quarter quilt you decide to start, you always end up having to buy background or plain fabrics. The other day I decided to make a mitten pattern (not the one above) and thought surely I had enough yarn stash – but no, I needed to buy half the colours as I didn’t have them. And the cowl pattern I bought with the wool for my honeymoon knitting project, I had to go and get the right knitting needles for it. So … maybe, you never get to just on a whim decide to start a project and wander down to the stash like it’s a store and pick out all your supplies. And if that’s the case, then what service does the stash supply other than making you feel bad about money spent, and time in advance already booked for projects past you decided future you would do. So I’m kinda toying round with the idea (ooh is this another New Year Resolution coming?) that maybe I should focus on reducing the stashes considerably and then planning projects and buying the supplies and then starting them. And truth be known, I always feel bad about buying supplies for big projects like a jumper so I buy lots of one skeins of things so it doesn’t look as bad. And yet … yeah there is no logic here. 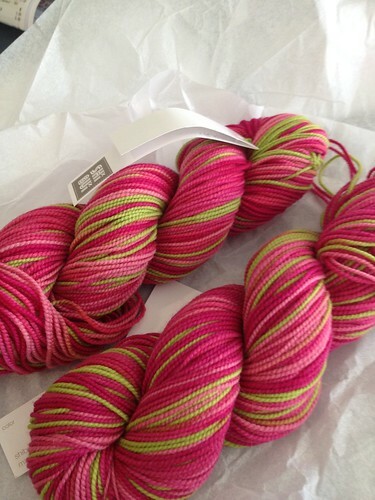 This decision of course comes after the Black Friday craft supply buying frenzy which bought me those gorgeous skeins of sock yarn by Shibui in Orchid. Though, those can be justified as being part of the Knitter’s Bucket List – a yarn that I am yet to venture to try but have always wanted to. And I guess, doesn’t have to be socks. Though wouldn’t putting on a pair of socks in that colourway just make you so happy about the day. And um. This. I have no excuses for this. I was browsing my fave online fabric store, the Fat Quarter Shop on Black Friday and discovered these Utterly Gorgeous Things – new! – called Mini Charm Packs or, I believe, candy … Anyway. WANT was all that I knew! And well … they’re so little and postage is flat rate and you can’t just buy one. 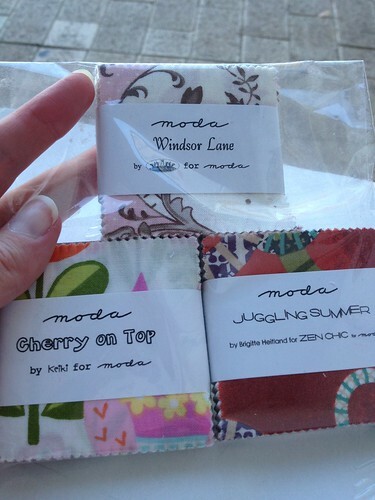 So I thought … hmmm … what if … what if I concocted a crazy craft project in 2013 (I know! So unlike me!) And what if it was like, buy say 3 packs of these a month and [ok. here is where the rest of this idea about a large, or possible several small, projects went to do with these charm packs] and an incentive that I couldn’t buy the next month’s packs until I had actually sewn that month’s allotment. It was sort of a block a month thing for myself. I think. The thing is, these arrived the other day, and for the life of me I cannot remember what the plan was. I can’t remember if I had a specific quilt pattern/project or if I was going to try something from some scrap quilters’ patterns or what. I have no idea what the idea was. Except. I really really like the incentive of use what comes in before you can buy anymore. So now I have to decide what to do with them. I would like to start this project (so I can order more cute itty bitty squares). Would love to hear any suggestions of charm square patterns. I checked out Oh Franssons’ Tokyo Subway Map but I think my choices won’t be monochromatic to work. I do have a whole heap of gorgeous solids thanks to the huge pack of fat quarters C bought me for Xmas last year which I spose technically according to this rule, I must now use and stop admiring the palette. The big question is … once I get married next week, will this intense frantic crafting mojo dissipate? First up. 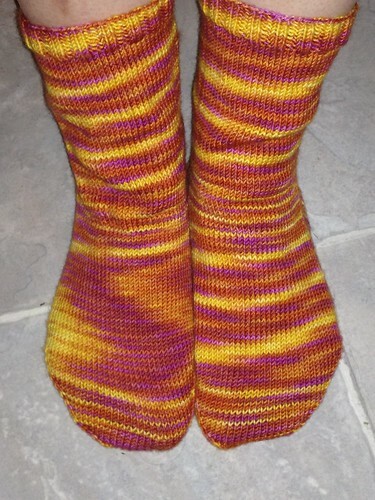 Finished pair of socks! These are my standard sock pattern in Lightweight Socks that Rock (Blue Moon Fiber Arts) in the colourway Zest. And they make me happy. They are like a tequila sunrise or something. I love that they don’t match. I think they look exactly like the end of a great day. I can almost smell the heat slipping out of the air as the sun slides out of the sky. Two days in a row of finished projects. I could get used to this! I picked up the closest work in progress when I finished my cardigan, something that wouldn’t require much thought to pick up and work on. It turned out these only needed the toe on the second sock which took not even half an hour to do. I think the stumbling was I’d lost one of the needles and I had to go find one. Sigh. So easy to put something down and find a stumbling block to prevent you just finishing it! I’m intending to do an “airing of the stash” a la Cast On which I’m hoping will both catalogue all my works in progress into a nice neat spreadsheet of to dos for next year but also find a bunch of projects that I might get excited about. I’m thinking of being a bit more stern with my stash management. I’m thinking of *gasp* culling some of the stash I may not like or prioritising gifting finished pieces to those who might appreciate the colourway etc. I thought it might be fun to set those up in kits going into 2013 and then having them as things to work through over the year. *If* that doesn’t make “fun” into “work”. The thing I’m starting to realise is, I tend to knit socks a lot because they use 1 skein of yarn and they justify the accumulation of random skeins of yarn that I love. And that’s what my stash is – a huge pile of single skeins of yarn. That you can only then make what? Socks, mittens, scarves or hats in. And jumpers etc are scary cause you have to invest more money in the yarn (and that makes it harder to justify changing your mind or going off a project idea …) But the stash itself has guilt attached – I feel like I can’t really buy more yarn that I like cause I have so much I have accumulated and done nothing with … I’m still wrestling with this guilt. So, dear reader, I have a problem. I like to buy tea. Not drink tea, mind, just buy it. And this little oddity is fine when you live alone. You rarely have to even acknowledge it. A friend may come to visit and you can pull out All The Teas, and they can feel a little bit special as they get to select from The Range. And that’s the end of it. But when you live with someone else, eventually they Notice. And then, once they’ve noticed, they start to take notes. And then, after a while, They Ask Questions. Questions like, “how on earth can you need MORE tea?” and “don’t you already have that kind?” and finally … “BUT YOU DON’T EVEN DRINK TEA!! !” this one is more a loud statement than a question and is usually made as said person is juggling packets and packets of tea as they tumble out of the pantry whilst he tries to put away your new acquisition. Because. You see, dear reader, I would *like* to be the kind of person who drinks tea. There. I said it. That other version of me? The one who cooks delicious gourmet soufflés in her ramekins and always offers to bring a dish to dinner and never ever has a dirty cup waiting in the sink and always remembers her third cousin twice removed’s wedding anniversary and doesn’t need prompting for the 63rd item on her to do list to get done? She drinks tea. And has a perfect complexion and figure. And you like her more than me. And it might be because she drinks tea. Or it might be because she calmly sits on her window seat on a Sunday afternoon sipping said tea out of a fine bone china tea cup whilst thumbing through Vogue and glancing out to her perfectly manicured garden. One of my 2013 New Year’s Resolutions is going to revolve around this issue. I think I should either rediscover my love for *drinking* tea, find a perfect way to store the 30 different boxes of tea I own or admit once and for all that I don’t actually drink tea, gift what I have and move on with my life. There. There it is, my first NYR for 2013. We’re looking after my parents’ dog, Morrie, at the moment. He’s quite old, not interested in making new friends, yet despite this, unbelievably patient with the puppy who does not take no for an answer. It took a good few days for Morrie to settle in. He kept looking like he thought Sasha had cooties. But yesterday, for some reason, he seemed to really settle in. He started patrolling the perimeter and sitting guard at the front door, in turns. This mesmerised Sasha who went from constantly antagonising Morrie to sitting in choice viewing spots and watching Morrie get hot under the collar. Now they are both tiring each other out and napping and not annoying us, more importantly. Anyway, I just noticed that Morrie puts himself to bed and then doesn’t get up for anything. Puppies on the other hand, are always up for any old caper and will happily wake up and wander down the other end of the house with you, no matter the hour. On noticing this, I remarked to C: We should get another puppy when Sasha starts to get old. C: I’m planning on doing that with you, too. C: Yeah, isn’t the old one supposed to train the new one? Me: You really want *me* training your next wife? C: maybe I’ll pay someone. So now I am sitting in bed, nursing a very painful spicy food incident and contemplating my holiday that was, as the prospect of hours to returning to the day job tomorrow approaches. Holidays are no way long enough and I really really wish I didn’t have to go to work yet. I only have 8 days left in this job to go. I of course got nowhere near what I had hoped to get done done. And I’m getting more and more scared about the longer commute that I have signed up for with my new job. I’m consoling myself on the first with the fact that the holidays have kickstarted my getting round to a bunch of things which I can continue to work on, in shorter spurts, as of tomorrow. I got started on sorting out and clearing out the two spare rooms which have some of the last, and worst, of my unpacking. You know, all the stuff that you don’t know what it is or what’s with it so you don’t unpack it cause you’d have to sort it out. I also sorted and tossed yet more of the postgrad stuff. I homed a few more of my pictures on various walls. Sorted out my quilting – did about half of my xmas presents (the rest still to go), discovered I had one quilt top finished and located backing and wadding for the finishing of the project (that’s as far as that got), almost finished the third quarter of the monochrome quilt, made up almost 50 of the charm hexagons for my charm quilt (and discovered I have many many triangles precut for this project). Ok, after that list, I guess I did ok with my holiday. I felt really like I had nothing left to give to the year and spent a lot just “pottering about the house” which is one of my favourite things to do when I’m on downtime. So I have to be happy with that. Even though a lot of things didn’t get progressed as far as I’d like. But I did get a bit of insight into how I operate – know thine enemy – in terms of procrastination. I figure if I can figure out why I don’t do things I really want to, maybe I can figure out a way around my own obstacles. Or something. Don’t read that too closely, it’ll give you a headache. I often figure up tricks to get myself to do things I don’t want to. And whilst, the making myself do things I don’t want to do is more a thing of the past, making myself do things I want to do is kinda new and still shiny. Anyway, what I discovered is I often abandon or avoid things when they require going to find something out, or figuring out how to do something, or if left fallow too long, not knowing where I was up to or what I was doing. So the whole sorting out my craft cupboard involved grouping like with like ie all parts of each project in one place and then taking stock to see where each was up to. And that alone was enough to get my enthusiasm back for about 6 projects at once. Often just identifying what the next step is (something C is often saying to me) was enough to help me move forward. It meant that instead of starting a bunch of new projects which had been my plan, I ended up happily working on older ones. I took this and applied it to other things, like sorting out scary packing boxes of doom, and emails that were waiting for answers, and TPP projects I’d stalled on, and found great success. It seems so simple but I think I need the reminder – when looking at something I’m avoiding, think up what just the next step is. Maybe that should be my thing for this year. Things have been quiet here because I’ve found myself doing exactly what I had planned to do this break – watch TV and sew. This is both time consuming and I’m finding myself zoning out with not much of importance to think on and to write about. I’d thought that I would have this break to work on new and exciting projects but what I’m really enjoying is picking up long ago started ones and working on them. It both feels good to work towards finally finishing things but also I’m enjoying the process without having to be creative. I’d wanted to take this time to be creative but really, I’m burnt out, it was a tough, big year and being creative takes inspiration and energy which right now I’m low on. And the clearing the decks on projects makes way for being creative later. I finally pulled out most of my craft to tidy my craft cupboard and take stock of the projects within. I have most of the quilting projects now itemised with an idea of where I’m up to with each ie the reason why I’d abandoned them cause the next thing was too hard. I still have my knitting and cross stitch to go but it feels good to get my head around what’s left and to also just sort it all and collate the projects which were a little jumbled and spread out due to my move. It’s sort of appealing to the tidying up frame of mind that I’m in right now. We’re slowly tidying and culling and pulling our home together. I’ve been hanging pictures and throwing out more junk and settling further in. I also started work on the backyard garden. It’s a very very small start – a couple of fruit trees which I have potted and have on the patio for now. And a few more herbs to go with the tomato plants I planted earlier. I’m sort of aiming to green up the patio first as I get my head around a much bigger plan for the backyard. I’d planned on doing the backyard as my 2012 project but that was before planning a wedding jumped the queue. That being the case though, I can’t leave the barren wasteland as it is for the next year either. So … something will have to be done. I’ve been thinking about new years resolutions and whether I should have any. I think though, in truth, that stuff, the ones you actually pull off, happen organically because they are the things you genuinely want to change or work on or towards and the rest is the list of things that you think you want or ought to be but are not. And I gave that stuff up last year – the whole wanting to be something that I’m not or like something or someone that I don’t. So writing a list of things that I wish I wanted to do or be … well, that’s not me anymore. And at the same time, there are things that I genuinely want to do better and I’m already working on those – keeping my email at zero inbox, not there yet but working on it. Being a better friend to those closest to me – again, working on that. And this year’s goals for Twelfth Planet Press. Last year we achieved Sales Goal B – Goal A was perhaps a little overambitious given the current state of the world and publishing so I’m happy to have achieved Goal B, especially since it was benchmarked to the Worldcon year of 2010. 2012’s goals are bigger still, I guess. And will require you know, the usual, to work harder and smarter and savvier and all that. It’s not a list of goals, I guess, if it doesn’t require ratcheting it up another notch or two. Dream big, otherwise why bother dreaming at all, yeah? Wishing you a happy new year and hoping your resolutions stick and your year is everything you hope it will be.